Ok so I try to avoid eating processed foods but this little Italian shop opened next to us and I asked if they made gluten free…”Si señora, we make it all”. Ok So a few days later I went back for my order and got the most luscious pasta. Once in a great while, I will treat my healed gut to this yummy treat. It was made with rice flour and avoiding this ingredient has been a challenge for me but I do try. 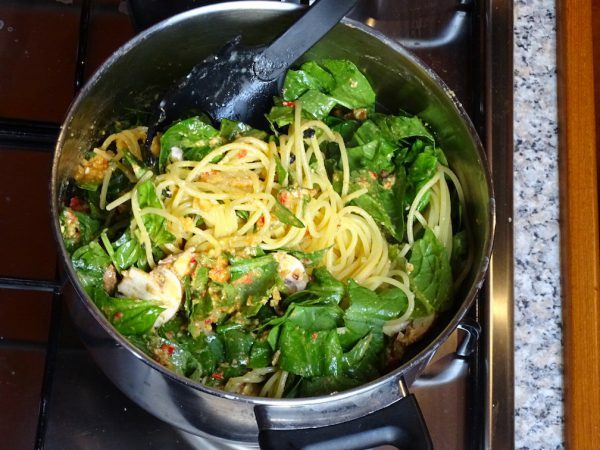 This dish can also be made using zucchini noodles which are just as yummy. The sauce is made from my Basil Cashew Ricotta Cheese recipe. It is rather simple. The only thing that can be an issue is that you have to soak the cashews for at least 4 hours in water, drain them and rinse before using them. Then put them in a food processor with garlic, oil, salt, fresh basil and some red peppers. This is the base for it and is so creamy just like Alfredo Sauce! I always make a huge jar of this and freeze it in individual serving sizes. I decided that on this rainy day, Italian food looked good. 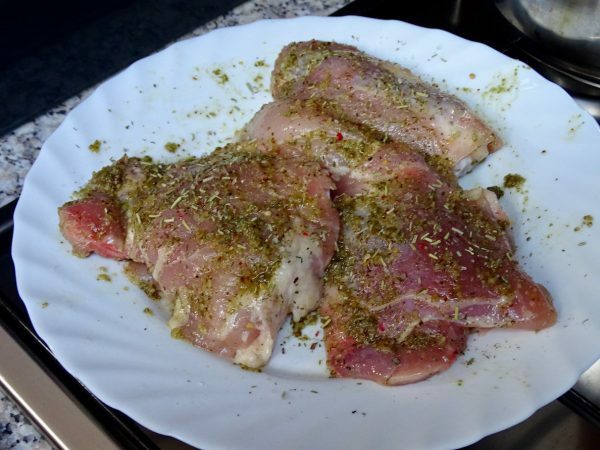 I searched my small fridge in the boat and took out some chicken thighs to defrost. I had pre-made a batch of condiments before I came on board our boat since I wasn’t sure I could find some of the ingredients while touring the canals of the Netherlands and Belgium. I prepared homemade Chipotle Chili Spread, Spicy Catsup, Basil Cashew Ricotta Cheese, Foolproof Mayo, B & B Pesto and several spices: Crazy Curry, Belle Italian, Cick’n Chick’n Seasoning. With the handful of spices and fresh basil, I set to work! This dish became a regular for us and my husband LOVED it. I caught him licking the pan during clean up time. Hope you enjoy licking the pan just as much as he did. Timing is everything. I suggest you prep 1) chicken 2) boil water for pasta 3) prep ingredients for the pasta 4) then cook pasta and chicken at the same time. 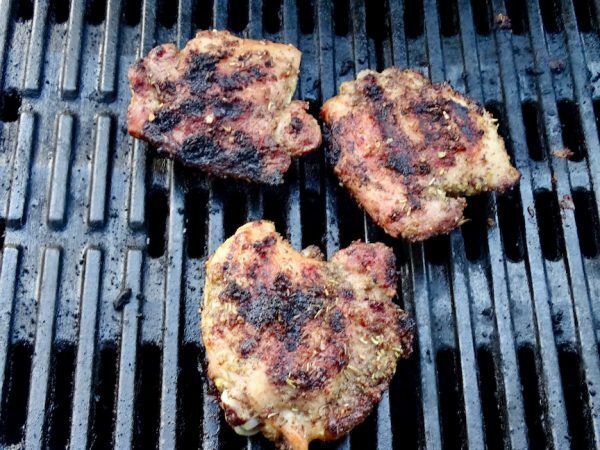 Rub the chicken thighs with B & B Pesto or your own favorite pesto. Grilling is the best! Grilling 7 minutes on each side. You can pan fry the chicken or place them under your oven grill as well. Boil your water for the pasta. 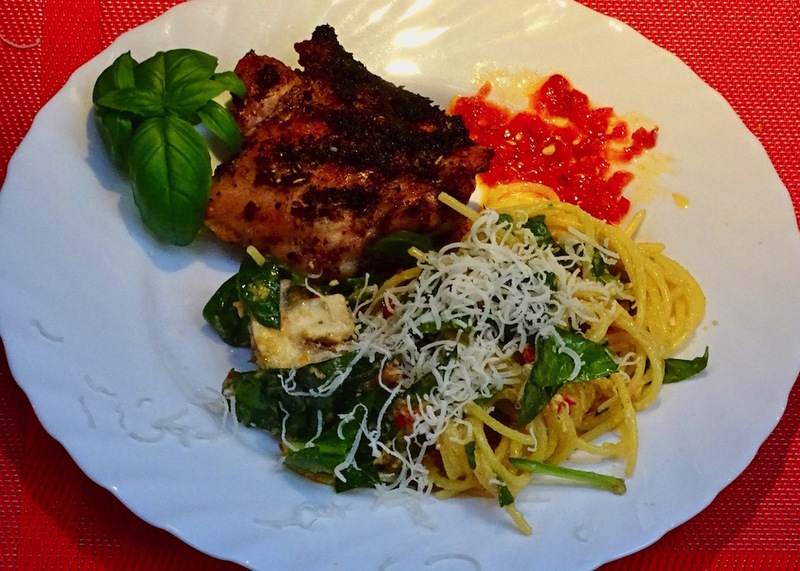 When the water is ready, place the chicken on the grill and the pasta into the pot! If your chicken finishes before the pasta, cover with foil to keep warm. Chop the spinach, mushrooms, garlic, and onions while the water heats up. Add pasta to the boiling water. As soon as the pasta is done, rinse with warm water (gluten-free pasta tends to be sticky). Place the pasta back in the empty boiling pot. 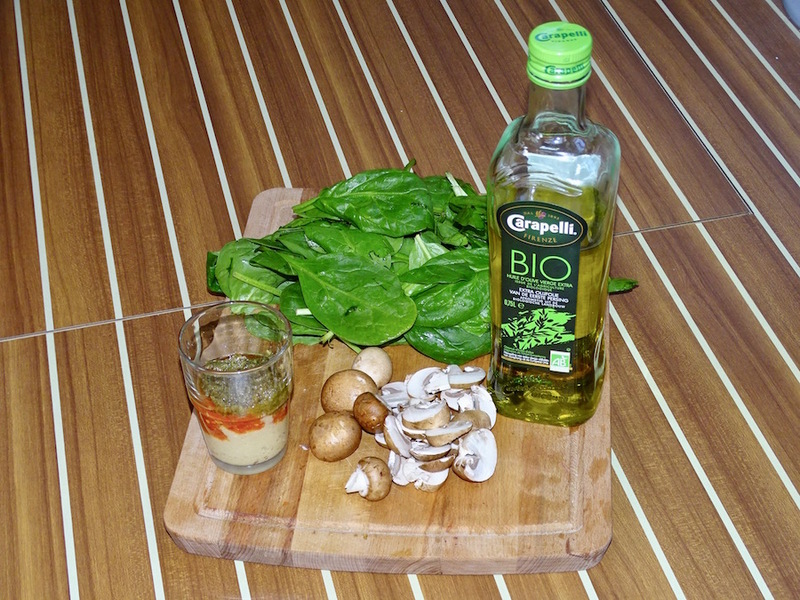 Add 1/4 cup of Organic olive oil to keep it from sticking together. Toss in your spinach, mushrooms, garlic, and onions in with the pasta. 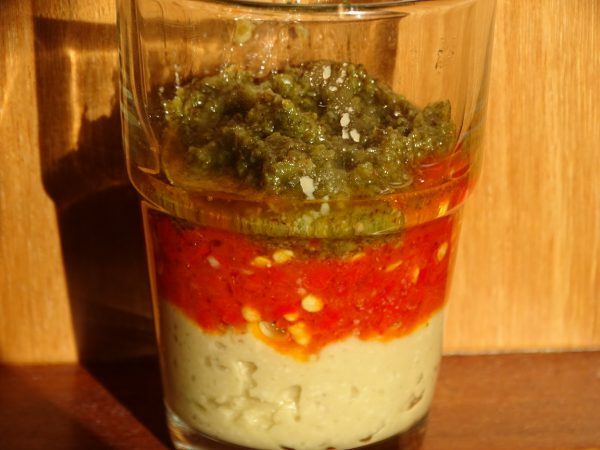 I placed the pesto, chipotle chili spread, basil cashew ricotta, Belle Italian Seasoning, pepper and salt in a cup and mixed it. Stir this sauce into the drained oiled pasta until all the pasta is smothered. Add the dry white wine if using. Cover and give it a minute to warm back up. If necessary, use a VERY low heat to keep it warm. 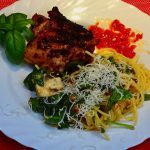 Serve alongside your Grilled Basil Chicken topped off with a bit of organic parmesan cheese and a sprinkle of cut fresh basil. TIP 1: Rustic Zucchini noodles: Spiral a large zucchini and add them last to the sautéed spinach, mushroom, chipotle chili and cashew cheese mixture so they don't get soggy. Tip 2: You can make this for your meatless Monday meals by eliminating the chicken. Change it up and add a few green or black olives. You can even add your favorite grilled seafood instead of chicken!